CD1 is an unmixed album. CD2 contains a bonus mix. The tracklist for disc 1 is printed on the back of the release, while the tracklist for disc 2 is printed on the disc itself. Track 2-8 is listed on the release as "The Pace, Original"
Hood makes with the mixed CD a perfect bonus to showcase his definition of minimalism and what Minimal Nation stands for. Are included in this 3 decks mix much more than the listed contents. Tracks from all the existing versions, ranging from the 3x12 EP version on M-Plant to the old 2x12 EP version on M-Plant (Grey Matter was named Grey Move) and including also tracks from the Axis version (The Pace, Acrylic), are blended all together, sometimes even twice with double copies. Crackles and evident surface noise proove old copies were used to make the mix but finally it sounds even better and organic and authentic. 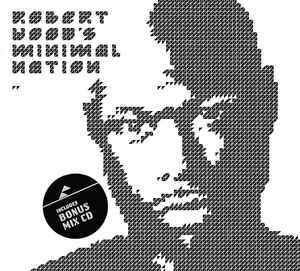 You can hear during the mix tracks from other projects, mixed together with the Minimal Nation tracks, like Internal Empire, Moveable Parts Chapter 2, Hood Music and much more... A complex but fantastic introduction to define how Minimal Nation has become a staple of modern minimal music.